Having now seen two of the three Best Picture frontrunners for the Oscars (this and The Revenant), and from what I know of The Big Short, it seems the Academy have two very distinct ways they can vote. On the one hand, they could go for the flashy cinematic flair of The Revenant, with its natural light and brutal long takes, or The Big Short, with its fourth wall breaking turns to camera and zingy delivery. Alternatively, they could go for Spotlight, which has none of the bells and whistles of its direct competitors, and instead pursues classical realist filmmaking invisibility. There are no visual ticks designed to direct the audience or fiery editing to work us up into a frenzy, instead we’re given a group of three dimensional, and deeply realistic characters each working through the case in hand with good old journalistic persistence. Few would have complained had Tom McCarthy (the director and co-writer, alongside Josh Singer) created something rather more brash. 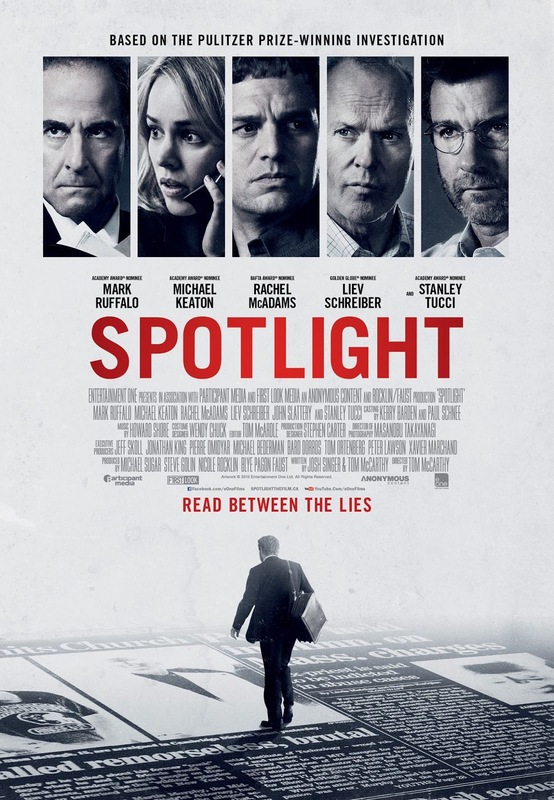 You see, Spotlight follows the true story of the titular investigative journalism team (played by Michael Keaton, Mark Ruffalo, Rachel McAdams and Brian d’Arcy James) at The Boston Globe in 2001 as the paper’s new editor, Marty Baron (played by a gloriously mousey Liev Schreiber), tasks them with their next project: to investigate the city’s numerous sexual abuse cases against the Catholic Church. But, as you can imagine, the criminal web they uncover is spread far beyond those initial victims. The film works as a brilliant journalism movie as these characters slowly, but surely, pick away at the church’s scabs. Discoveries are seen to be made after days, weeks, or even months of hard work. As a result, the film avoids the pulse-raising cinematic pitfall of portraying investigative reporting as a series of unrealistic eureka moments. McCarthy is smarter than that and he knows he’s got the characters, and the performers, to do this story justice. The ensemble is gold, with the firepower of the central team joined by the likes of Stanley Tucci and John Slattery. Ruffalo, in particular, is at his ruffled best playing the plucky, and somewhat clipped, Mark Rezendes, but every cast member delivers. Schreiber is a particularly interesting case. He underplays here in a way that I’ve never seem him pursue before. Through a combination of mumbles and measured body language, this once physically sturdy actor sinks back into his editor’s chair really impressively. Only for him to rise up again with his mannered, but intensely determined, delivery. The focus drifts away from him for a significant central section, but that takes little away from Schreiber’s transformative performance. His unexplained drive early on did leave me with the thought that Marty had a far closer connection to the issue at hand than we’re given here, but the fact that my mind spiralled like that is simply a testament to McCarthy’s outstanding character creation and Schreiber’s layered performance. As I have previously mentioned, on a purely cinematic level, Spotlight plays it quite safe. The colour palette is all off-whites and subdued tones, both in and out of the office, which does tend towards blandness as things go on. This isn’t helped by the noticeably digital cinematography. I don’t make this complaint all that often anymore, but the film, as shot on the Arri Alexa camera, does look ‘digital’ at times. This varies scene by scene, but there were an unfortunate number of instances when I noticed the slightly cheapened image. That being said, the lack of visual flamboyance does have the focusing effect of directing your attention to the characters and the unravelling investigation. The camera angles also do little to surprise and the editing is purposeful, but never inflammatory. I had questions about the supposed lack of flair going in, and they lingered, I must admit. McCarthy rarely seemed to be challenging himself on a cinematic level, of that much I had settled upon. However, as things progressed, I came to the conclusion that McCarthy’s avoidance of the spectacular was in fact a deeply effective filmmaking choice. By maintaining a strong sense of realism throughout, McCarthy establishes an emotional focus that kicks in with every distressing advancement. Also important in that regard is Ruffalo’s character. Mark Rezendes becomes a vital dramatic fulcrum as any thoughts of a quick story approach soon makes way for a more valuable, and more effective, long haul technique. Marty values the work of the Spotlight team so much that he sets his sights on exposing the rampant abuse from the top down. In the heat of the moment, it’s a development I found frustrating, especially given that it’s agreed upon as a group. So, the fact that Rezendes leaps in to exclaim that the longer they delay the story the more children that are at risk is vital. Just as I’d been dissatisfied by the decision of a handful of the main characters, McCarthy tempers that with Rezendes’ unabashedly emotional response. It’s a subtle, but highly effective, piece of audience awareness. A big thank you to the FDA for hosting the screening!